Be Sure to Ask for Chef Specials! A traditional, crispy pastry stuffed with mashed potatoes, green peas and light savory spices. Samosa turned inside out, crushed samosa served with chickpeas, onion and our combination of house chutneys to give you a street food from home! Crispy popped rice, mixed with diced onion, tomato, spices, nuts, chickpeas, tamarind and fresh mint chutney. Fresh restaurant made cheese with a spicy twist. A combination of pan-fried bell-pepper, onion and cheese in a fusion sauce that best represents North Indian appetizers. Our house Paneer in a lightly spiced chickpea flour batter which is deep fried to give it a crunchy yet soft finish. A combination of jullienned vegetables in a chickpea flour batter, rolled up and fried to make it into the crunchy, childhood snack that we all grew up on. Our vegetarian special appetizer platter that is ladden with our unique options. You have a vegetable samosa, aloo (potato) pakora, vegetable pakora, and paneer pakora with a light vegetable garnish and a dusting of chaat masala. Mild-spicy Chicken, fried and tossed with curry leaces and mustard seeds. Chicken breast cuts battered in a sourcream and chickpea flour mixture and then fried to a crisp. An Indian take on chicken fingers/strips. Minced lamb with peas stuffed inside a crisp pastry, crunchy, warm and savory. A true non-vegetarian delight. A house favorite, yogurt marinated chicken breast with a moist finish. Cooked in our traditional clay oven to a soft and fluffy texture. Giving it a tangy and flavorful taste. Our non-vegetarian special appetizer platter, ladden with our best fried options. You have a keema samosa as the center piece surrounded by chicken and fish pakora on a light sauce drizzled platter with chaat masala and a vegetable garnish. A traditional delight, also called "Butter Naan" that is simplistic yet an undeniable member of every meal here at Pakwan. Unleavened white bread baked in a clay oven, making it soft and fluffy. A naan with a fresh cillantro garnish applied to it along with finely chopped garlic before it is tossed into the oven to glaze it. Stuffed naan with a savory minced lamb filling. Imagine a soft savory center to an already delectable bread. Our way to acknowledge the lovers of spice and bestow them with a bread truly made for the capsacin loving eaters. Fresh, diced green chilli coated bread, cooked in the oven with a hint of cillantry and spice. Dry fruits Naan (upon request). Naan with a generous stuffing of onion and/or paneer. A Punjabi flat bread that you can't eat chickpea/chole without! A traditionally flat, multi-layered whole wheat bread that is eaten as a breakfast bread with protein. A multi-layered bread stuffed with grated cauliflower/potatoes to make it even more enjoyable with curries. Pairs well with our dahi. A malai/cream layered take on the Paratha, giving it a soft and velvety finish that is always going to leave you wanting more. A pan grilled, soft and round whole wheat bread that is a staple of most traditional North-Indian dinners. Being light and fluffy, it is an exquisite pair with vegetables and lentils. A tandoori baked whole wheat bread, with a crunchy yet moist finish. A light deep fried bread that is a staple in Indian Cuisine with turmeric based vegetable dishes. The pakwan bread basked encompasses a variety of different forms of bread to give diners a holistic taste of our tandoori capacity. You have Naan, Onion Kulcha, Garlic Naan and Roti to feast! Boneless chicken cubes served on a sizzling griddle. Skewered minced chicken served on a sizzling griddle. Juicy lamb cubes. Served on sizzling griddle. Skewered minced lamb. Served on sizzling griddle. Murgh Tandoori, Murgh Tikka, Reshmi, Boti, Seekh and Jinga Kebabs. Served on sizzling griddle. Diced and chopped Okra with fresh onion pan fried in with the dish to give it a glazed finish. Overally, a savory dry-dish that pairs excellently with whole-wheat bread. Combination of mixed vegetables,herbs and spices. Fantastic combination of green peas and pulp of eggplant. Seasonal fresh vegetables cooked with a blend of spices. Paneer done in mildly spiced sauce. Whole potatoes in a curry sauce. Chicken Tikka cooked in a rich creamy gravy. South Indian style chicken curry. Stir fried combination of chicken, bell pepper, onions, tomato finished with cream. Spicy semi-dry preparation of lamb with vegetables. A fiery Goan delicacy of potatoes with a touch of vinegar. Tender goat meat slowly cooked in our special curry that is infused with South Asian spices. Lamb chops cooked in Tandoor and garnished with grilled vegetables. Lamb chops sizzled and marinated in our special mango sauce. 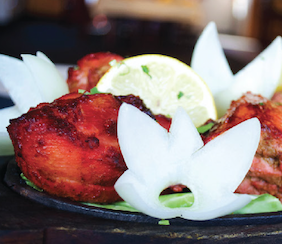 Tender bites of boneless lamb marinated in a blend of freshly ground herbs in the tandoor. Shrimp cooked in Mughalai style. Seafood, sweet potato and mango mingle in a Caribbean-inspired dish. Spicy, and sour curry that originated in a small city of Goa. Rice, seafood and vegetables are key ingredients. Red onion, green chilli and lemon pieces. Varieties of chutney and hot pickle. (hot) Tea with Indian spices. (hot) Strong Indian coffee with milk. Yogurt smoothly blended with sweet/salt. Mango yogurt smoothly blended with sweet.